A Mexican food company develops a packaging technology to expand its reach. la familia: Daniel Gutierrez, president of Mexican Food Specialties, says he is proud to carry on the family business that began with his great-grandfather, Raphael Gutierrez. The company is expanding the distribution of its products to other states outside the Midwest. 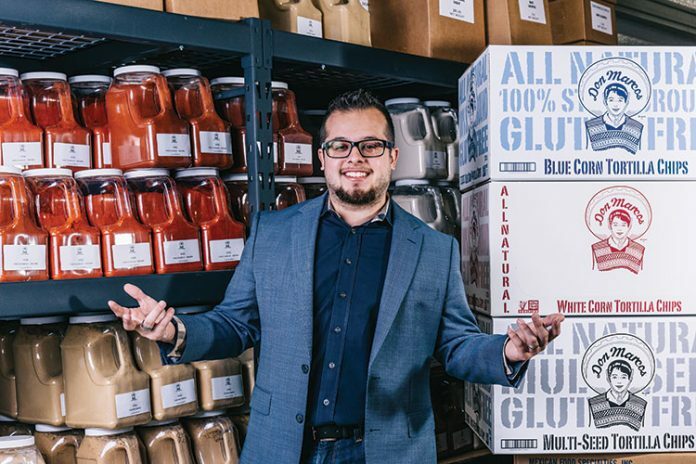 Daniel Gutierrez, president of Mexican Food Specialties Inc. in Livonia, has spent the last 18 months refining the Holy Grail of fresh tortillasâ€…—â€…targeting a shelf life of up to 30 days. Soon to be introduced across the Midwest under the company’s Don Marcos product line, the longer-lasting tortillas will be a boon to the company’s 2,000 distribution pointsâ€…—â€…including restaurants like Barrio Cocina Y Tequileria in downtown Plymouthâ€…—â€…as well as serving as a springboard to customers beyond the Midwest. In addition to using natural ingredients, Gutierrez says extending the shelf life of tortillas involved the development of a special, proprietary film that lines the inside of the bags. He also utilizied innovative packaging technology to lower the amount of internal oxygen tortillas are exposed to, among other innovations. The company’s Don Marcos tortilla chips will also get a boost with new craft-style packaging. Gutierrez says all of the company’s products come from a plant in Chicago where everything is made, packaged, and shipped within 24 hours. Along with its tortillas, the company offers an assortment of rice and bean products; bulk spices like ground coriander, chili powder, and taco seasoning; and salsas, sauces, cheeses, jalapeno peppers, nuts, and pre-cut tortilla chips. Besides selling its goods in Michigan, the company distributes its products to customers in Ohio, Indiana, Illinois, West Virginia, and Kentucky.